MCSquared PR inked a $6.4 million deal with the government of Ecuador last year, according to documents filed with DOJ on July 3. 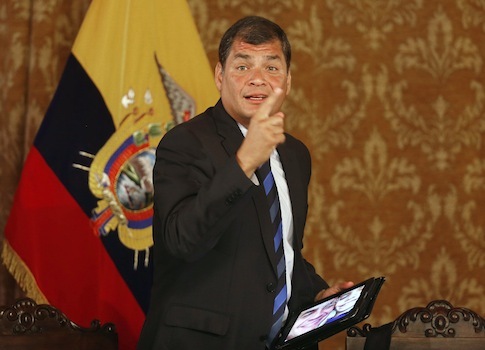 The documents reveal that MCSquared is "subsidized," "directed," and "supervised" by the Republic of Ecuador. Its work for that government was conducted between May 1, 2013, and April 30, 2014, according to a contract filed in conjunction with its DOJ registration. The firm received $534,000 per month for its PR efforts. The Foreign Agent Registration Act requires that companies register with DOJ within 10 days of the finalization of a contract detailing advocacy or public relations work on behalf of a foreign government, and before that work actually begins. According to the filings, MCSquared’s work for the Republic of Ecuador began on May 21, 2013. DOJ says it received its FARA filing on July 3 of this year. According to the DOJ filing, the Ecuadorian government hired MCSquared "to inform the US public of Chevron's responsibilities so the public interest of Ecuador will be furthered." Its "responsibilities" involve the enforcement of a multi-billion-dollar legal judgment against Chevron in Ecuadorian courts, which the company has tried to prevent from being enforced in other countries where, unlike Ecuador, it actually has assets. MCSquared’s Chevron work included organizing junkets of celebrities and politicians to the Ecuadorian Amazon, where environmentalists and the government claim oil company Texaco, acquired by Chevron in 2001, spilled large amounts of oil. One junket attendee was Richmond, Calif., mayor Gayle McLaughlin, who was forced to amend a financial disclosure form in May to note that she was paid nearly $5,000 by MCSquared on behalf of the government of Ecuador to travel to the country in September. According to the firm’s FARA filing, it has paid another PR firm, FitzGibbon Media, nearly $200,000 for "media relations" and "media ad-buy placement" services this year. FitzGibbon Media, which has also represented Wikileaks founder Julian Assange, an ally of Ecuadorian President Rafael Correa, filed this month’s FARA registration on MCSquared’s behalf. The filings also detail more than $125,000 in expenditures for advertisements in the Washington Post, the West County Times, and an unnamed San Francisco newspaper. More recently, MCSquared recruited indigenous Ecuadorians to protest outside of a Chevron shareholders meeting. Maria Garay, the firm’s executive director and sole stockholder, denied any role in organizing those protests, despite claims made by a spokeswoman for plaintiffs in the long-running legal battle against Chevron that MCSquared "handled" the event. She claimed that the firm "currently does not have an engagement with the government of Ecuador" in a June email but did not respond to follow-up questions about whether such an arrangement ever existed, and why its past work on the government’s behalf was not disclosed to DOJ. According to Garay’s short-form FARA registration, she is an Ecuadorian national who was naturalized as a U.S. citizen in 2003 following her marriage to an American citizen. The firm’s FARA filings note that the Republic of Ecuador does not own it. However, some MCSquared employees have direct ties to the government. Jean Paul Borja, an Ecuadorian citizen who is listed as a "communications advisor" to the firm, is a frequent contributor to the state-run media outlet El Ciudadano, where he occasionally attacks Chevron (other Ciudadano writers have lashed out at the Free Beacon). Another MCSquared employee, Cynthia Zapata Solis, previously worked in Ecuador’s Ministry of the Environment. This entry was posted in National Security and tagged Ecuador. Bookmark the permalink.